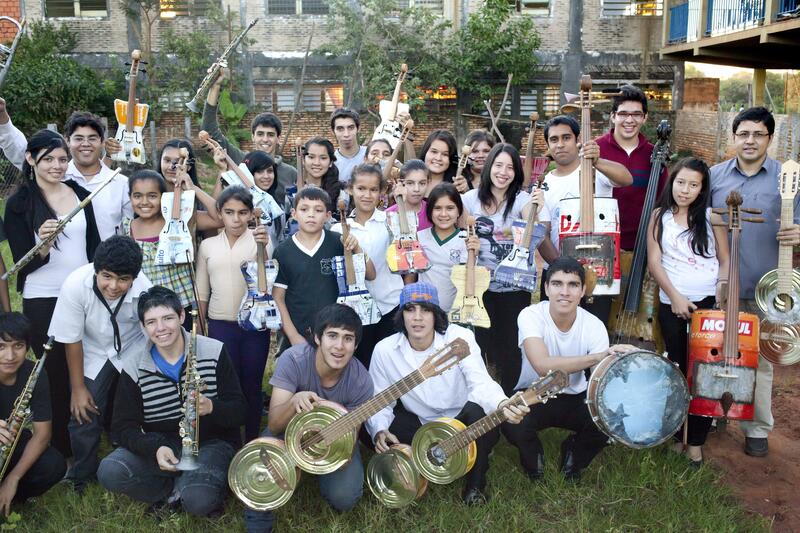 Have you heard the story of the Recycled Orchestra of Cateura? If not it will make your day. Maybe even your week. Back in 2006, Favio Chávez, an environmental engineer, started working on a waste recycling project at the landfill of Cateura in Paraguay, in one of the poorest slum areas in South America. Around 500 people live on that landfill, searching for garbage they can use or sell. Almost half of the children in this area do not go to school, they have to help their parents make a living. Somehow. Like digging through mounds of waste. So Chávez got to know people living there, and he felt a need to help the children. Having a musical background, he decided he would teach them to play music instead of playing with garbage. It was not an easy task, with children who knew nothing about music, with no other place to rehearse than the landfill, and too often without parents to communicate with. Parents don’t necessarily live with their children at the landfill in Cateura. But then, as it often happens, music does something with people. Parents noticed that music kept their children out of trouble, and some abandoned children were even reunited with their parents. And then there were more children than instruments. Chávez, together with one of the men working his way through the garbage, began experimenting with making instruments out of what they could recycle from the landfill; tin cans, forks, bottle caps… And then they worked on improving the instruments, to the point where an orchestra with its very own special sound could be formed. Also, these were instruments the children could safely carry around with them and keep with them, without having to worry about being robbed. Given the cirumstances of these young musicians, this very special recycling project already meant so much. But then a short video was published on the Internet and they went viral. Now they’re hugely popular, and children from outside the landfill come to join them – some 200 now take classes there. And they get to go outside of the landfill. Way outside. The Cateura Recycled Orchestra is travelling the world, and right now they’re in Norway, performing at the renowned Bergen International Festival along with Norwegian musician Sondre Lerche, who says that the orchestra bring so much more to his songs given the special sound of instruments made the way these instruments are. Thanks to this popularity, the orchestra and music school will now have a roof over their heads and instruments.They have also inspired other people in other places to create similar musical projects, helping children in need. Learn more about the documentary Landfill Harmonic here.